This tutorial covers the use of the Enterprise Browser Gesture API for recognizing touch screen gestures. 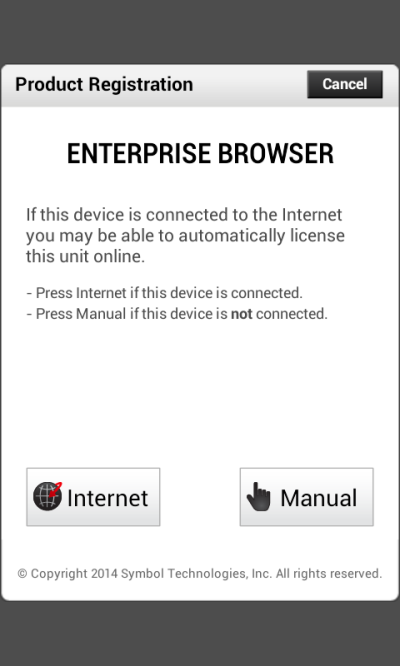 Enterprise Browser includes an API for recognizing touch screen gestures. The steps shown below are typical for code that uses this API. The following tutorial will walk through creating a working example application using these steps. Create a file named gesture.html in your application directory and open it in a text editor. Make sure the file doesn't have an invisible '.txt' extension. Copy and paste the contents of the starter template above into the file and save it. var diagsTag = (diagsOn)? 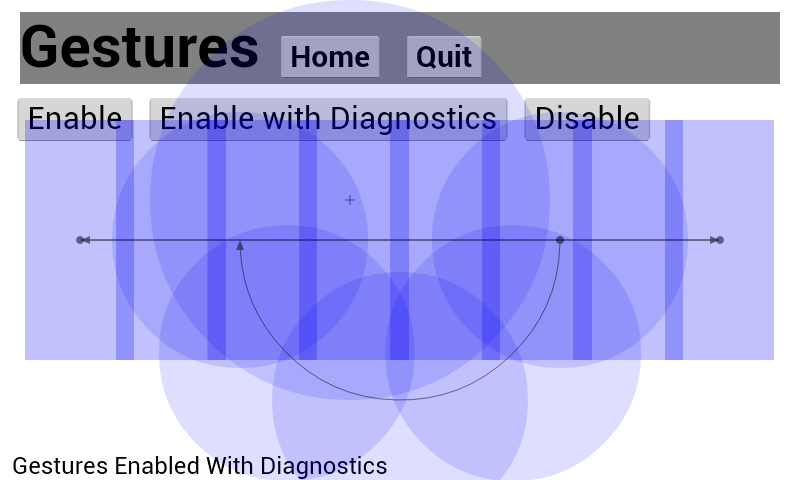 "With Diagnostics":""
Gestures are created by setting several attributes and then executing gesture.create(). Four gestures are created in the first four sections of the code. The diagnostics attribute being set for each gesture is used to turn on visual feedback for testing purposes. Toward the end on the line that starts "gesture.detected = ..." we assign a method to be called whenever a gesture is detected. The final two lines display a status message to let the user know that gestures have been enabled. NOTE: For more details about defining gestures, please refer to the Enterprise Browser Gesture API documentation. The gesture handler in the previous method was set to fnGestureDetected(). Add the fnGestureDetected() method to the end of the SCRIPT section. Data is passed to the callback function in the form of a JSON object. The id of the gesture that was detected is one of the values passed. The code above posts an alert with the id of the detected gesture. In a production application, you might use the callback to initiate navigation. Next we'll add a means to delete any active gestures. When this function is called, it sets and then deletes the current gesture once for each of the gestures that were previously created. The last line displays a text indicator to the user. 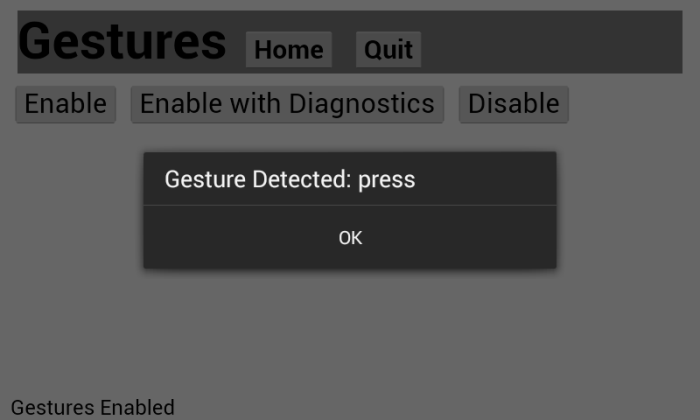 Create a directory on your device for the Gesture application. Make sure the directory is in an unrestricted location to avoid any permissions issues when Enterprise Browser tries to open the files. We'll place our sample app's files in the device's root directory and show you how to modify the config.xml file accordingly. Update the StartPage setting in config.xml to point to the location on the device where you placed gesture.html and save the changes. Click on the Enable button. The status in the lower left hand corner changes to "Gestures Enabled". Now try swiping your finger from left to right across the middle of the screen. 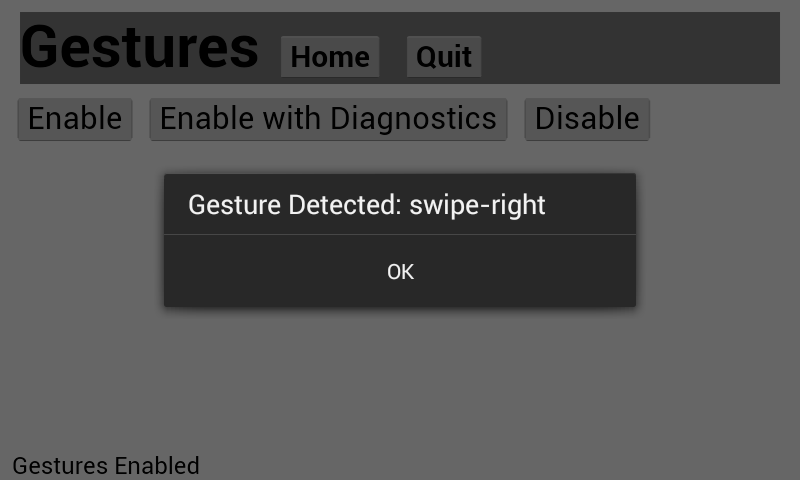 The callback function will be activated and you will see an alert dialog displaying the detected "swipe-right" gesture. Click OK to dismiss the alert. Then, press and hold a point near the center of the screen. The callback function will be activated and you will see an alert dialog displaying the detected "swipe-right" gesture. Click the Disable button. You will see the status text in the lower left hand corner change to "Gestures Disabled." Click the Enable with Diagnostics button. The status will change and the screen will be overlaid with images that display the active gesture areas and paths. Try slowly tracing the semicircular path with your finger. 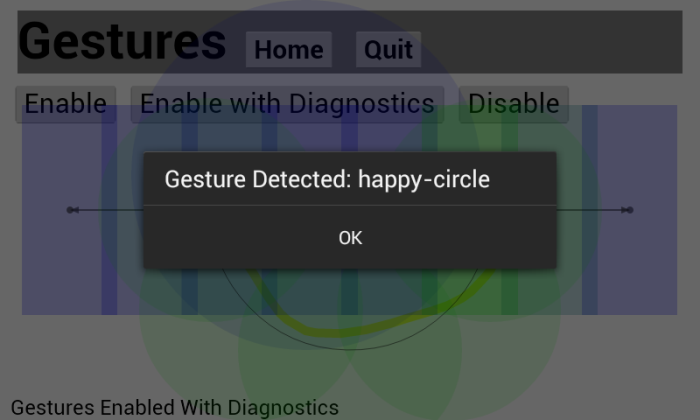 The Happy-Circle gesture should be detected. This completes the Enterprise Browser Gesture API tutorial. 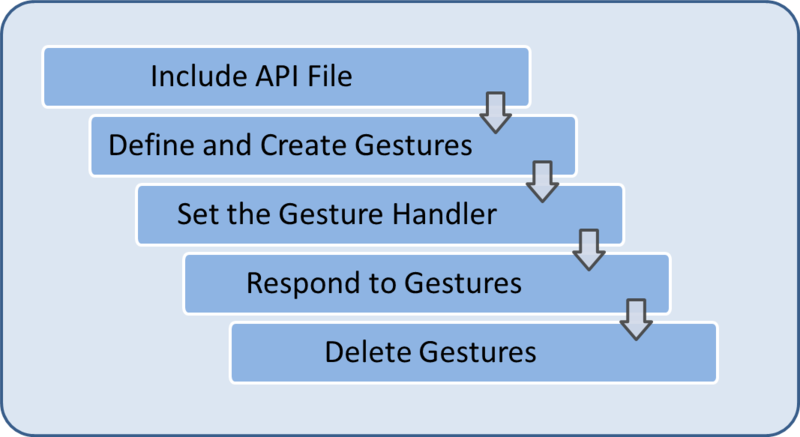 For more information on the Gesture API, please refer to the Enterprise Browser Gesture API documentation.